I love Apple. I am not ashamed to admit that I am pro-Apple products and software. They really do make my life easier. Except when they don’t work. Or work very, very slowly… We’ve had an iMac since 2008, so 3 years. That’s getting on in the computing world. And for the last year, this computer has been slow. Not just a little slow. Old PC slow. The spinning beach ball was starting to get more screen time than anything else. I do a lot of stuff on my computer – email, web browsing, photo editing, downloading music and videos, word processing, spreadsheets, you name it. We have all of our digital life on this little machine. And I spend so much time on it that the slowness of it was becoming a problem. Not just a little problem – a BIG problem. I spent half my time on the computer just waiting. For programs to load, things to save, web pages to refresh, emails to pop up. It was painful. Last week or so my iPhone updated to the new iOS 5 software which includes iCloud. I had already been intrigued by iCloud and the new OSX for my desktop, Lion. I was considering buying it but was waiting for some time to sit down and research it. I played around with iCloud and decided I liked it. So I went to the Mac App store to purchase Lion. I couldn’t buy it. I needed 2GB of RAM. My computer only has 1. ONE! Uno. Solo. Could that be the reason for the slowness? I started to research in my web browsing way. And lo and behold, this iMac is capable of 4GB. 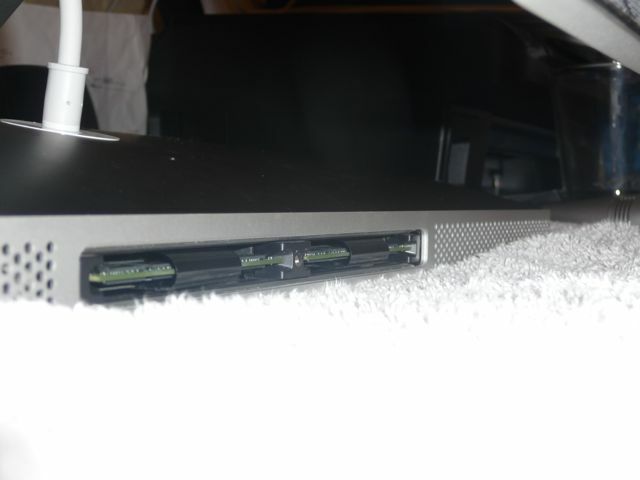 It has 2 RAM slots which can handle 2GB each. Well I’ll be! I started to research some more and found a Canadian online company, CanadaRAM, with very good reviews. They sell RAM for this Mac (Apple doesn’t, it’s too old!). They also have a quote system whereby you tell them what you have and what you want, they quote what you need and then guarantee that what they quote will work. If not, you return it. No problems. So I ordered 4 GB on Wednesday. IT CAME IN THE MAIL THE NEXT MORNING! Seriously! That was fast. So I installed it before dinner and now my tired old iMac has a new speedy lease on life. Applications load in a snap. Multiple programs run without crashing. Application switching is lightning fast. My iSight doesn’t have a lag. It’s almost miraculous. 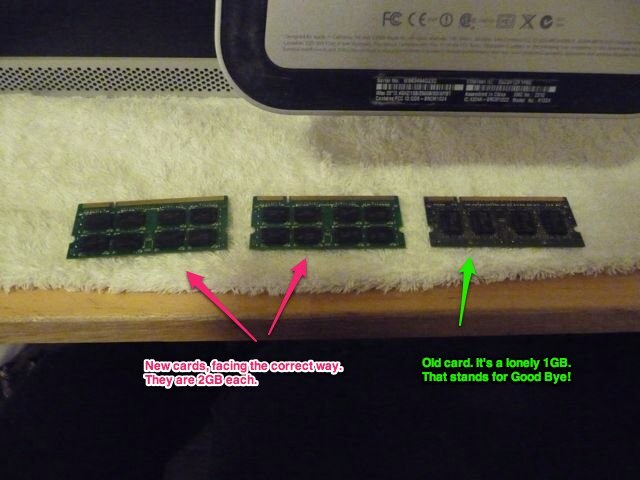 I even took pictures of changing the RAM so I could post a little tutorial. But really, it’s super-easy. Let’s upgrade! Very carefully lay your baby iMac screen side down onto a clean soft towel. This will protect the monitor from scratching and give you access to and visual of the memory compartment. Notice the lovely diagram printed on the base, detailing how to do EXACTLY WHAT I’M ABOUT TO TELL YOU. Locate the memory compartment by gently lifting the stand. Be careful because it only pivots just enough for you to get at the compartment. Notice all of the dust and vow to clean your office more often. Or at least once. The instructions (on page 33 of your “Everything Mac” guide) tell you to use a #2 screwdriver. I used a 3mm Phillips from my handy-dandy mini screwdriver set. The cover is pretty easy to remove as it’s only held with one screw. And pull on the tab with the card. I had to give this a good tug with both hands. The card contacts are very tight. The card will pop part way out so you can slide it the rest of the way. Slide it out and keep it facing the same way so you can match up the new card(s). These are my new 2GB cards. Here you can see all the fancy numbers and stuff. But notice that they are the wrong way up. For some reason this pic is a different size. Oh well, it’s fitting as the old card is smaller than the new cards. I’m boosting my RAM 400% from 1GB to 4GB. Slide the new cards in and give each one a good push until it “clicks” in. I had to push pretty hard. At first I wasn’t sure they were going to go in, but eventually they did. Remember to tuck in your tabs. Screw the cover back on, stand ‘er up, plug ‘er in, turn ‘er on, and fire ‘er up! I noticed a difference right away.